In an effort to learn more about the extent of stony coral tissue loss disease, Florida Sea Grant agents in South Florida are training recreational divers to conduct surveys. Learn to properly identify and report stony coral tissue loss disease to monitor disease progression and recovery along the Florida Reef Tract. The free training is followed by an optional dive. May 4, 2019 - 9 a.m. Divers and snorkelers can reduce their likelihood of transferring stony coral tissue loss disease through proper buoyancy, avoiding touching marine organisms and sanitizing equipment between dives and before and after each dive excursion, especially when travelling between countries or between infected and uninfected locations. Remove debris and sediment following each dive. Between dives, sanitize gear that contacts corals with a bleach solution. Other gear should be washed in freshwater with an antibacterial soap. Use quaternary ammonium solutions to decontaminate dive gear after return to shore. Properly dispose of disinfectant solutions and rinse water in a sink, tub or shower. Never pour into the ocean or a storm drain. Non-sensitive equipment – After each dive, soak equipment (weight belts, tools, etc.) for 10 minutes in a 10% bleach solution (1 quart bleach per 2 gallons water). Rinse with fresh water; air dry. Wetsuits, Buoyancy Compensation Devices (BCDs), mask and fins – After each dive, soak for 10 minutes in one of the following: 0.5% RelyOn (four 5 g. tablets/gal. water), 1% Virkon S (1.3 oz./2 gal. water), 6.6% Lysol (1 qt./gal. water), or an equal concentration of another quaternary ammonium disinfectant. Soak in fresh water for 10 minutes; air dry. BCD internal bladders – Pour approximately ½ liter disinfecting solution into the mouthpiece of the exhaust hose while depressing the exhaust button, inflate BC, and gently rotate in all directions. Allow to sit for 10 minutes. Flush twice with fresh water. Regulators, computers, gauges, underwater cameras and other sensitive scientific equipment – Soak for 20 minutes in a solution of warm water and antibacterial dish soap or OdoBan (5 oz./gal.). Rinse in fresh water; air dry. Additionally or alternately, thoroughly wipe with isopropyl alcohol. This protocol does not endorse, recommend, or favor any specific commercial product, process, or service, or the use of any trade, firm or corporation name and is provided only to inform the public. Safety data sheets for chemicals and user's manuals for equipment developed by product manufacturers provide critical information on the physical properties, reactivity, potential health hazards, storage, disposal, and appropriate first aid procedures for handling, application, and disposing of each product in a safe manner. Have you seen this tag? Divers and snorkelers in the Florida Keys can assist in monitoring the effectiveness of experimental treatments on diseased corals. 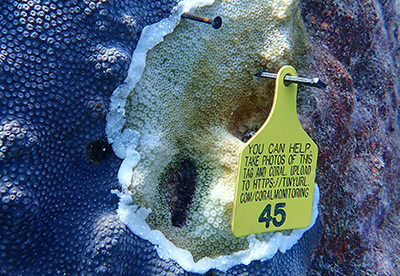 You’ll find hundreds of tags on treated corals at Carysfort South, Key Largo Dry Rocks, Grecian, Molasses, Crocker, Sombrero, and Looe Key reefs. Snap photos of the tag, the whole coral colony and any lesions or lines, especially near any nails in the skeleton. Then, upload the photos to seafan.net/tags. The visuals will help scientists determine how the disease is responding to various treatments. Report both healthy and unhealthy corals to assist in tracking the disease outbreak. Be a citizen scientist by reporting what you see out in the water. Note your location and describe the coral condition. Include photos to assist scientists in determining areas that need investigation. The Southeast Florida Action Network (SEAFAN) is a reporting and response system designed to improve the protection and management of southeast Florida's coral reefs. Five Southeast Florida counties have developed a regional program to help tourists, boaters and divers understand how they can help conserve and protect our reefs. By following the Reef Ambassador’s simple set of easy to remember rules, you too can help defend the reefs and become a Coral Champion. Visit Respect Our Reef for tips about smart diving and fishing practices and take the online pledge. The campaign and website are presented by The Nature Conservancy and the Florida Reef Resilience Program, a consortium of federal and state reef management agencies, nonprofit organizations, science and educational institutions committed to protection and sustainable uses of Florida's coral reefs, with funding from NOAA.